Though many are still shocked in the wake of the London Bridge attacks – key questions will undoubtedly emerge following this latest act of terror in the West. “British Prime Minister Theresa May’s Conservatives have a lead of just one percentage point over the opposition Labour Party ahead of the June 8 election, according to a Survation poll conducted for the Mail on Sunday newspaper. The poll showed said May’s lead had fallen sharply from a lead of 12 percentage points in the previous Survation/Mail on Sunday poll published on May 21. Will this sudden terror attack give the Conservative Party a bounce in the polls only days ahead of the General Election? As it turns out, this morning Prime Minister Theresa May announced that, once again, General Election national campaigning has been suspended. May made the exact same announcement immediately after the Manchester Bombing two weeks ago. “Eyewitnesses spoke of there being two or three masked men, who got out of the van and started attacking people with knives. A second incident is believed to have taken place at the Borough Bistro, in Borough Market. Eyewitnesses have told of seeing a man being stabbed by someone wearing a red hoody. The attacker then walked calmly away, and gunshots were heard near the Brindisi tapas restaurant. 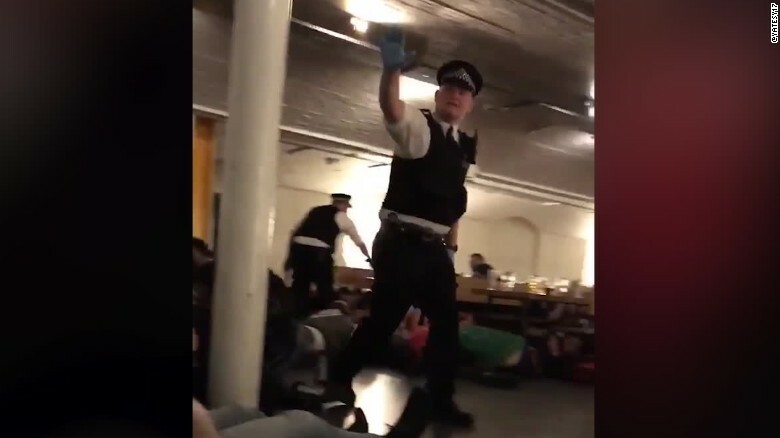 The BBC is reporting that a security guard who works across multiple bars and pubs in Borough Market claims to have seen a man with a canister strapped to his abdomen. Stressing that the reports were unverified, the news channel claims the man saw the attackers after receiving a call from a colleague in another bar who said people had been stabbed. The eyewitness described people running away screaming from three men, one wearing a red and black top. He claimed one man had a canister taped to his abdomen. The man and his colleagues tried to throw chairs at the three attackers, who were going in and out of different bars, before helping to evacuate the area. “A British Transport Police (BTP) officer was stabbed in the face as he responded to the terrorist incident at London Bridge. Emergency services rushed to the scene following reports of a vehicle ploughing into pedestrians around London Bridge and stabbings at Borough Market shortly after 10pm. The BTP officer, who was on duty, was one of the first on the scene after he responded to calls for help from the public, the force said. NOTE: In this same area, London Bridge, was placed on lockdown and the area evacuated back on March 7th – due to a stolen car found abandoned and left yards away from the famous Shard Building. Additional eyewitness testimony reportedly states that the three masked men believed to be the alleged attackers have been shot, while seen outside a pub with ‘hoax suicide vests’ on. As previously mentioned, the event may affect election polling results – possibly benefiting the ruling Conservative government who were plummeting in the polls over the last week – amazingly, only 4 days from the scheduled voting day on June 8th. It is undeniable that because of this event, on the heals of both Manchester and Westminster terror events, the Met Police have accumulated more power in terms of their role in helping to manage “national security.” Likewise, these events may be used to devolve more power and clout to the British Intelligence Services. If this were indeed an ‘ISIS Attack,’ it is hard to see how ISIS/ISIL would benefit, other than hasten its own demise by baiting increased airstrikes on Syria by NATO member states. The Trump Administration could easily seize on events in London to call for increased “Anti-ISIS” operations in Syria and Libya, but it should be pointed out that since this latest anti-ISIS US Coalition began in 2014, US-led efforts have had very little effect on the spread of takfiri militants in the Middle East. This leaves the only real beneficiary here as being the Pentagon and the wider military industrial complex itself. QUESTION: Why would terrorists be outfitted with fake ‘hoax suicide bomb vests,’ if their objective was mass casualties? This aspect will most likely be swept aside, as mainstream media might suggest that the alleged attackers could not obtain real explosives – but this doesn’t adequately explain why they were wearing fake suicide vests. In less than a few hours, a “series of coordinated terror attacks” has been declared by MET police. QUESTION: Will the three masked London attackers have ties to ISIS or al-Qaeda – while also maintaining a link to British security services as seen in other ‘Known Wolf’ cases? As with previous high-profile ‘terror’ events, the mainstream media and authorities have been quick to assign a motive and categorize the event as a “terrorist attack.” The official narrative is that the perpetrators were ‘inspired by ISIS’ and were following appeals by so-called ‘Islamic State’ leaders on the internet to use the Islamic holy month of Ramadan to carry out random attacks against non-Muslims in London. POST-MANCHESTER: In a ‘show of force’ Theresa May placed troops on the streets of Britain, but under the command of the Met Police. It’s important to remember that prior to the Manchester and Parliament Square attacks, mass casualty drills had been held and in one case, Met Police rehearsed a ‘terrifyingly realistic‘ drill on the River Thames. As we’ve mentioned at 21WIRE numerous times in recent years, many political leaders and media operatives bang the drums of security over so-called terror ‘sleeper cells’ (see the the London Boys sleeper cell) hiding in a nation near you – none of them acknowledge the historical fact that they themselves have also helped to harbor, grow, foment and radicalize individuals through counter-terrorism operations for decades. – Suspects have alleged connections to terror or terror networks (potentially security as well). – Multiple suspects reportedly have ‘radicalized’ views on religion, feeding a prepackaged media narrative which may conflict with other details about said individuals. – Sensational media projections that bring in additional story lines for dramatic effect. – A ‘presumed’ terror motive is publicly accepted with vague evidence provided. 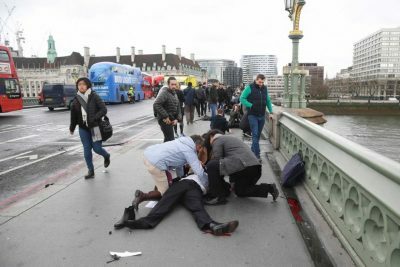 QUESTION: Will the London triple attacks increase racial and ethnic tensions in the West, while also pushing the public into accepting a more direct military intervention in Syria – if so, who benefits the most from this latest attack? Author Shawn Helton is Associate Editor of 21st Century Wire, as well as an independent media forensic analyst specializing in criminal investigations and analyzing media coverage of terrorist events and theatres of war.